Further investigation showed that engine 6195 (on this bike) comes from a 1923 Model 2 touring motorcycle. The gearbox, magneto, suspension damper, and Andre steering damper, footrests are all much later. 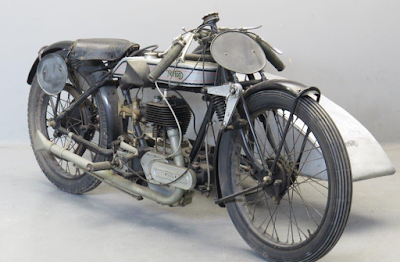 It could therefore be described as an exercise in using up odds and sods to which someone, Bill Fruin perhaps, attached a Brooklands replica sidecar. Was it ever raced at Brooklands? Bill Fruin perhaps rode (rode, not raced) it there in postwar years. There have been reunions there since the fifties. The Brooklands Society was formed quite early on and Fruin was an early member. Now it is for sale again on eBay. The Australian advertiser has stated that he has been told the outfit 'was used many times at Brooklands' and has used the original Yesterdays text to describe the machine which ends with the line "It would be worthwhile to do further research into the racing history of this outfit!". This description may suggest a bit more than would be true. Honestly, this thing looks nice and like a lot of good fun to thrash around. Further, a Norton is worth whatever anyone is willing to pay but we would not put much value on the racing history or originality of this one. Postscript: -SG- We learn this has sold for £19575 and we wish the new owner lots of enjoyment with it. We are advised that, in the original sale of Fruin's collection, the log books got muddled up and the correct registration number for this particular machine should have been XO913, which, due to inefficiency, went with an OHV 588 (Lot 236). In fact, in the whole sale there was but one early machine with matching numbers. No surprise to me. Incidentally, Brooklands Reunions actually at the track (there were small get-togethers earlier at the Hand and Spear pub in Weybridge) did not start until 1967. I attended the first with a loaned ex works New Imperial and many others down the years, and Fruin does not figure in the 1967 event programme. I certainly don't have programmes for other years' events to check, and frankly don't ever recall seeing Bill plus this outfit there. But perhaps I just overlooked it!